WAFFLES: Hey Boss! What are you looking at? KATIE: I'm not really looking. I'm just thinking. WAFFLES: What are you thinking about? Chicken? KATIE: No, Waffles. There's more to life than just chicken, you know. KATIE: NO, Waffles. We're just very lucky. WAFFLES: You've GOT to be talking about chicken! KATIE: We're the lucky cats, Waffles. Somehow, we were chosen. With me it was Gloman. And with you it was Glogirly. They chose us. They didn't even know us, but they loved us from the very first moment they saw us. We're the lucky cats, Waffles. We have a safe home where there's always breakfast and dinner and treats and toys. We have a family. WAFFLES: Doesn't everycat have that? KATIE: No Waffles. Not even close. WAFFLES: What can we do? We're just a couple of cats. Pretty small cats. 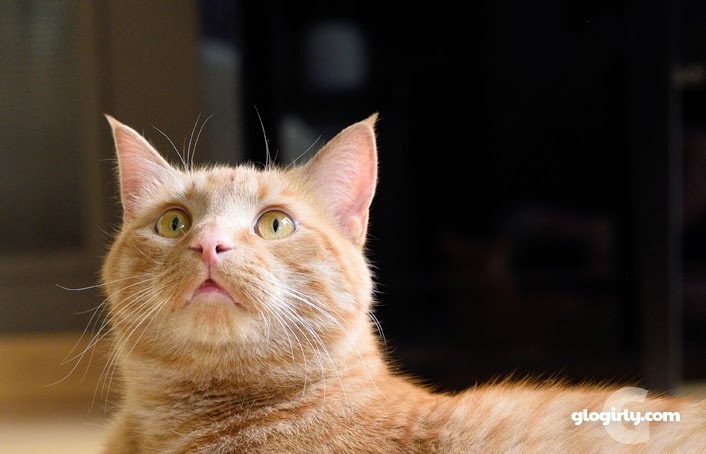 How can we ever do anything big enough to help all those cats? KATIE: Well, small is ok. Because lots of smalls can make something BIG. help turn a bunch of smalls into something really BIG. True words Miss Katie. We're very lucky to have the family we have. It breaks my heart that so many go without having a loving family. So true. 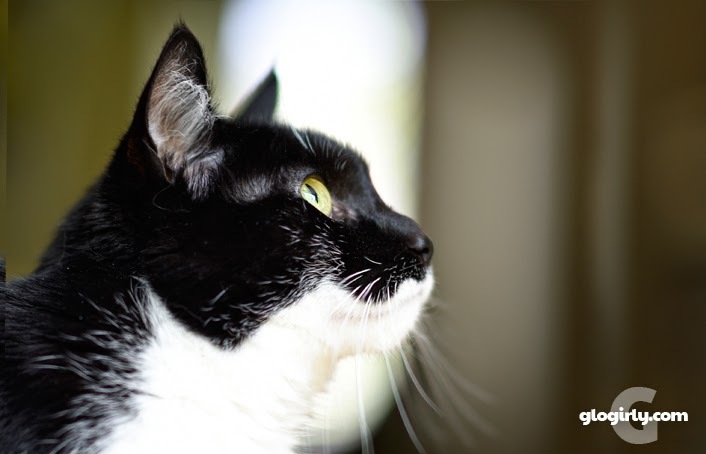 We count our blessings every day and purray for all those kittehz in need. Thank you for your really lovely post! We blogging kitties are so much luckier than so many others. I will always remember that for all my life - and I vow right this very minute to continue Sparkle's legacy of helping less fortunate kitties. Yup, we are lucky cats. Yes, we are blessed kitties so we can bless others. 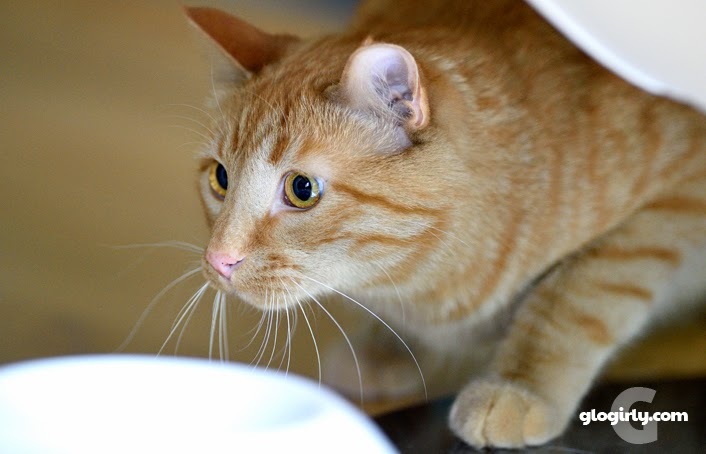 Yes, Katie you and Waffles are very lucky, and with our help we can make sure that more kitties receive the love and attention they need so that they have the chance for a wonderful life. Thanks for sharing about the commentathon--we will attend! That IS true. All of us kitties in the blogosphere are lucky and most of us also have purrsonal assistants who do our typing. Let's do something BIG and attend the commentathon! We're joining in on the commentathon and having one too. So we can make the smalls into something even bigger! Boy don't we know how lucky we are. At least with Junior, he was in a rescue, but me and Sammy were turned out and left in the cold and heat till Meowm saved us. Emmy had a home, then ended up in a shelter and was saved just in time. Off we go to comment. If Meowm wasn't shelling out green papers to do a kitty transport this weekend, she would donate to a rescue. But she is doing her part getting a kitty to his forever home. Every week when I get home from my cleaning shift at PAWS and see my own dear formerly feral Tommie and Mickey Mouser, I know just how lucky they are. And how amazingly lucky that we found each other. I love that phrase, "Because lots of smalls can make something BIG." We're lucky dogs, all 4 of us. Although I think Waffles doesn't know how lucky he is because he is lacking fried chicken. Silly boy! He has the life, right Katie? It's so true, Katie and Waffles. You are lucky, and so are we. And lots of smalls DO make a big. Hugs to you both, and to Glogirly, too. Thanks for the reminder! We're going right now. You both are very lucky, and so are your humans because they found you. Thanks for reminding us about Sparkle - we've been trying to make all the rounds and did donate in her honor at Tabby's Place. You are very lucky. We stopped by Sparkle's blog. She is in our hearts. Lots of smalls really do add up to something big! We really are lucky cats, you're right, and we have to be sure to give some back. You are right. All of us who have happy homes are very lucky. 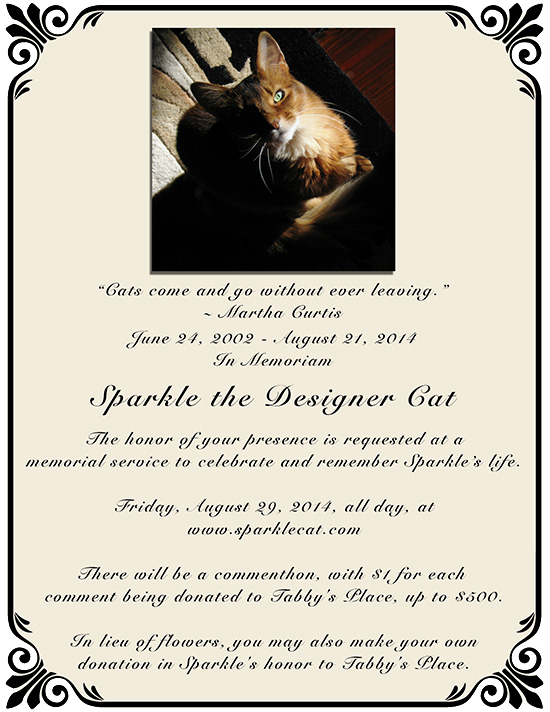 I have been to Sparkle's Memorial service. You are so wise. It's good for us to remember our blessings. Our Mom has been to visit Sparkle's service. We are joining in the commentation. We have been by Sparkle's memorialto pay tribute. We are indeed very lucky kittehs. Pop fell in love with me when he first saw me on Petfinder. Yep, from small things, big things sometimes come, as The Boss would sing. Yep, we is blessed beyond imagination with our loving home. Far too many don't have close to what we have. We are all very lucky kitties and puppies here too. We joined Sparkle's and other comment-a-thons today and donated today at Tabby's Place. We hope we can make a difference in those kitties' lives. we are loving all of the GOOD we are seeing around the blogosphere today! home..food..treats..toys..and most of all LOVE..We don't have a lot but we always share with any kitty or puppy that needs us..Sparkles passing has reminded us humans how much our pets mean to us..how fragile their little lives can be..and how much they give back to us every day..we visited her memorial yesterday and donated to Tabbys Place in her memory..We..as humans and kitties must make sure that the love and caring that she started never ends..pass it on..and on..and on..it is the least that we can do to repay all that she gave to us..Lots of smalls can make something BIG..So right Katie..you and Waffles are so lucky to have the loving family that you have..Hugs to everyone..